Today was the regional competition of WRO 2015.
there was one strong team that was a possible threat, but luckily I was able to do a perfect run, and win! I am going to participate in the WRO2015 National competition representing Kyoto. 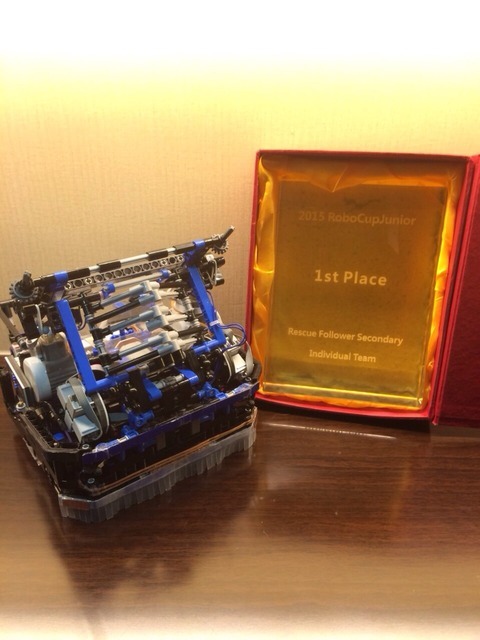 Our team finally became world champions in this year’s RoboCupJunior Rescue Line Secondary category, and received the best programmer’s prize!! We actually started off really bad on the practice day. However, we improved as time passed, making our robot do its best on the last day. In addition to the result, especially for the last day, our robot was able to do a very satisfying run on a terribly difficult track. Although the competition was tiring and tough, meeting up with friends around the world, and competing with so many brilliant robotic teams was very exciting and enjoyable. If I look back, our team won all the competitions starting from Kyoto, in this possibly last RoboCupJunior competition. I am very proud of my self, teammate, and my coach for this result. Finally, thank you so much for all the robocup officials, volunteers, friends, teammates, and my parens for all the support and letting me have this amazing life experience!! 5日間の白熱した戦いの末、やっとロボカップジュニア、レスキューラインセカンダリー部門で世 界一とベストプログラマー賞を勝ち取ることができました! !初日の練習日はとても調子がわる かったのですが、走行を重ねることに問題を一つ一つ解決していったことで、常に進化すること ができました。その成果、最終日はとても満足できる走行ができ、結果も内容もいい形でこの大 会を終えることができました。今回もいつも通り大変疲れる大会でしたが、各国の友達やライバ ルと再会したり、世界の強豪とロボット競技をできるということで、再びロボット競技、ロボッ ト大会の楽しさを感じました。振り返ると、今年度の大会は予選からすべて一位で通過すること ができました。こんな夢のような結果をもたらしてくれたチームをとても光栄に思います!最後 に、僕のことを支えてくれて、こんな素晴らしい経験をさせてくれたロボカップの大会関係の方々、 友達、チーム、そして家族に心から感謝しています! !